Click the button below to add the Face Painter Pro Starter Kit - Tag Body Art Australia to your wish list. This Pro Starter Face Paint Kit has been one of our best sellers since we introduced it 5 years ago. It's everything I wish I had when I started in 2011... but don't take my word for it, read the product reviews and see what our customer's say about this fabulous face paint set. Putting together a pro-level, working face paint kit can be daunting. With a seemingly endless array of colours and brands to choose from, brushes, sponges, glitters and more... figuring out exactly what you need get overwhelming, fast. But with this FABulous face paint set, you can kiss confusion goodbye. Offering a great return on your investment, this kit includes enough paint and glitter for several hundred faces and should pay for itself within the first few hour's of work (assuming you charge a minimum of $5 per design). This face paint starter kit is perfect for anyone who plans to launch a rewarding small business, or as an upgrade to the smaller face painter at home kit (sold separately). We think this set would also be a sure-fire hit for childcare providers, schools, fairs, and fundraising events. It has everything you need, minus the overwhelm of putting it together yourself. Backed by our 5-Star service and expertise, this set is ideal for beginners to professionals. This face paint set is a wonderful gift idea for any artist, guaranteed to delight! We recommend ages 8 and up; but with the help of an adult, younger children will also enjoy many hours of creative fun with this lovely face paint set. No previous experience needed! Please read the features and description below for more information about this product. If you have any questions, please contact us. Who is this palette for? 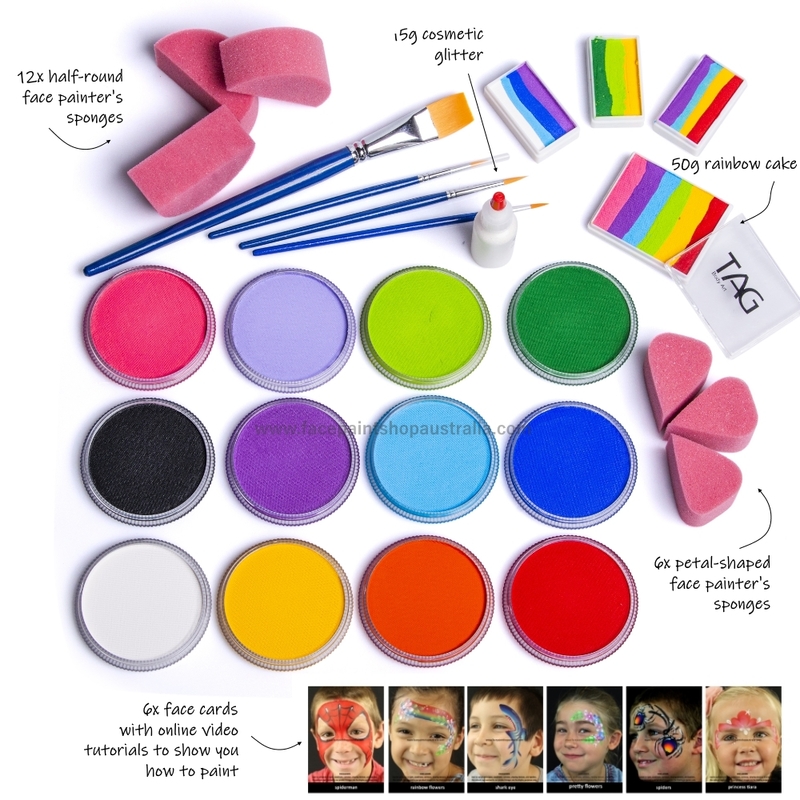 Whether face painting for fun, for fundraising, or for profit, this handy set of 10 colours plus 6 rainbow cakes is a great starting point, without compromising on quality. This is the same brand used by professional face painters. These products are not available in your local discount or general store. With so many options, this palette will give you the perfect introduction to the wonderful world of face painting. Activate with water and apply with a brush and/ or sponges. This palette is ideal for make-up artists, sports team supporters, parties for children, festivals and fairs. ✔ Avoid contact with fabrics. These highly pigmented products may stain. Why Buy Quality Face Paint and Body Art Products from Face Paint Shop Australia?